Three children in the kitchen. Kids cutting paprika. How to cook healthy food. Children cooking at kitchen table. Little girl with a tablet. How to count calories. Three kids in the kitchen. Little girl cutting onion. Cooking classes for children. 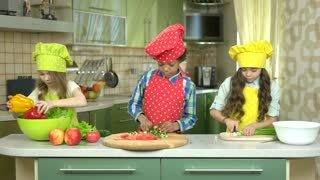 Three kids making salad. Smiling children in the kitchen. 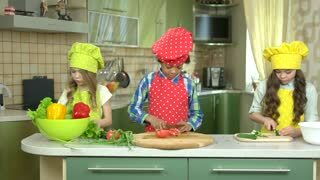 Three kids cooking. Children cutting fruits for salad. 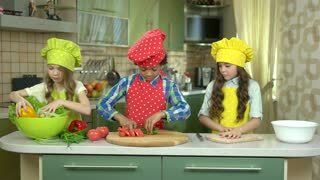 Children cooking in the kitchen. Boy cutting cucumber. Hands of boy cutting paprika. Kid cooking food. Children cutting vegetables. Fresh fruit on the table. Cooking school for kids. 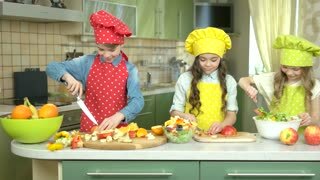 Children cooking food. Boy cutting lettuce.